As you can see the resistor RL (R2) is connected between the Aout pin and the ground, so if you are having a module the value of RL can be measured by using a multimeter in resistance mode across Vout pin and Vcc pin of the module. In my sainsmart MQ-137 gas sensor the value of RL was 1K and was located here as shown in the picture below. However, the website claims that it provides a variable pot of RL which is not true as you can clearly see in the circuit diagram, the pot is used to set the variable voltage for op-amp and has nothing to do with RL. So we have to manually solder the SMD resistor (1K) shown above and we have to use our own resistor across the Ground and Vout pin which will act as RL. The best value for RL will be 47K as suggested by datasheet hence we are going to use the same. Now that we know the value of RL lets proceed on how to actually measure ppm from these sensors. Like all sensors the place to start is its datasheet. The MQ-137 Datasheet is given here but make sure you find the correct datasheet for your sensor. Inside the datasheet we are need only one graph which will be plotted against (Rs/Ro) VS PPM this is the one that we need for our calculations. So gab it and keep it someplace handy. The one for my sensor is shown below. Turns out that MQ137 sensor can measure NH3, C2H6O and even CO. But, here I am interested only in the values of NH3. However you can use the same method to calculate ppm for any sensor you like. This graph is the only source for us to find the value of ppm and if we could somehow calculate the ration of Rs/Ro (X-axis) we can use this graph to find the value of ppm (Y-axis). To find the value of Rs/Ro we need to find the value of Rs and the value of Ro. Where Rs is the Sensor resistance at gas concentration and Ro is the sensor resistance in clean sir. From the datasheet we also get to have a formula for calculating the value of Rs. The formula is shown below. If you are interested to know how this formula is derived you can read through jay con systems, I would also like to credit them in helping me to sort this out. In this formula the value of Vc is our supply voltage (+5V) and the value of RL is the one that we calculated already (47K for my sensor). If we write a small Arduino program we could also find the value of VRL and finally calculate the value of Rs. I have given an Arduino Program below which reads the analog voltage (VRL) of the sensor and calculates the value of Rs using this formula and finally displays it in the serial monitor. The program is well explained through the comment section so I am skipping its explanation here so as to keep this article short. Note: The value of Ro will be varying, allow the sensor to pre-heat at least for 10 hours and then use the value of Ro. I concluded the value of Ro to be 30KΩ for my sensor (when RL is 47kΩ). Yours might slightly vary. Now that we know the value of Ro we can easily calculate the value of Rs using the above two formulae. Note that the value of Rs that was calculated previously is for fresh air condition and it will not be the same when ammonia is present in the air. Calculating the value of Rs is not a big issue which we can directly take care in the final program. Now that we know how to measure the value of Rs and Ro we would be able to find its ratio (Rs/Ro). Then we can use the chart (shown below) to relate to the corresponding value of PPM. Although the NH3 line (cyan colour) appears to be linear it is actually not linear. The appearance is because the scale is divided un-uniformly for appearance. So the relating between Rs/Ro and PPM is actually logarithmic which can be represented by the below equation. To find the values of m and b we have to consider two points (x1,y1) and (x2,y2) on our gas line. Here we are working with ammonia so the two points I have considered is (40,1) and (100,0.8) as shown in the picture above (marked as red) with red marking. The complete program to calculate PPM using a MQ sensor is given below. Few important lines are explained below. Then read the Voltage drop across the sensor (VRL) and convert it to Voltage (0V to 5V) since the analog read will only return values from 0 to 1024. 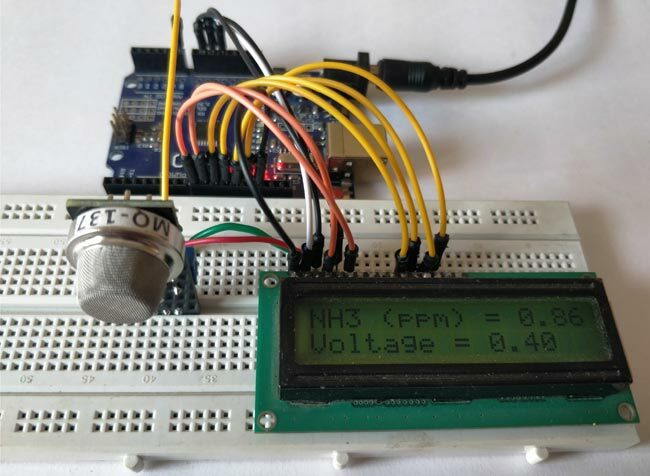 Enough of all the theory let us build a simple circuit with the sensor and LCD to display the value of gas in PPM. Here the sensor I am using is MQ137 which measures ammonia, the circuit diagram for my set up is shown below. Connect your sensor and your LCD as shown in the Circuit diagram and upload the code given at the end of the program. You have to modify the Ro value as explained above. Also make the changes in parameter values if you are using any other resistor as RL other than 4.7K. Leave your set-up powered for at least 2 hours before you take any readings, (48 hrs is recommended for more accurate values). This time is called the heating time, during which the sensor warms up. After this, you should be able to see the value of PPM and the voltage displayed on your LCD screen as shown below. Now to ensure if the values are really related to the presence of ammonia, let’s place this set-up inside a closed container and send ammonia gas inside it to check if the values are increasing. I do not have a proper PPM meter with me calibrate it and it would great if someone with meter could test this set-up and let me know. You can watch the video below to check how the readings varied based on the presence of ammonia. Hope you understood the concept and enjoyed learning it. If you have any doubts leave them in the comment section or for more detailed help use the forum here. Sir your value in LCD is 0.86ppm. How can you relate that with the NH3 Odor Threshold value of 0.037ppm and NH3 Recognition Threshold of 46.8ppm??? Sorry Archie cant get your question!! Where did you get this threshold value of 0.037ppm? Hi, I closed this slip, but the voltage is 0.40. 00 ppm. The problem is where is the thank you. Please correct a small error, the value of the resistor RL on the PCB is 1K, which should be replaced by one of 47K, but RL is not the one indicated (which is a 10K), RL is next to 5R1 on the Photography. this minimizes the required charge transfer to the S/H capacitor." Man this is just what i needed to carry out my research thanks man!!!!!!!!!!!!!!!!! Thanks a lot. I tried applying the same to the MQ-136 sensor for reading hydrogen sulfide. The graph is exactly the same. So I noticed one thing for calculating b: The result of your formula is not correct. Also the ratio value of the point should be 0.85, not 0.75. Thanks for pointing it out robert. b = 0.323. I try with wolfram and get better value. Can you explain this? Thank you so much for sharing this. However, I just started to read Ro and it is showing me negative values. I am not sure if that happened to you. I hope in 10 hours start to display positive values. Its weird that you get negative values. I have never seen negative values. Anyways let us know how it turns out!! Thaks for replying me. Well the datasheet shows that MQ137 reads from 5 to 200ppm NH3. I just saw that ppm it is too small to see it from the lcd so I just multiply for 1.000 to see something. Perhaps I cannot say that my sensor is able to read from 0 to 5000 but I hope those readings are able to show when the compost decrease its ammonia. Multiply by 1.00? I cant get the idea. You did a mistake. Your Calculating the Value of Ro at Clean Air was incorrect since this is a log scale graph. The (x,y) coordinate that you get also a rough estimate. This leaded you to an incorrect gas concentration. Hi, I'm beginning to work on this project. So, for RL, I should replaced the 1kohm SMT resister with a 47kohm SMT resistor ? "we have to manually solder the SMD resistor (1K) shown above ", do you mean remove this 1k ohm resistor? I'm reading negative values from Ro. I already changed the cables and the sensor. What else could be causing this wrong reading? Did you allow the sensor to heat up for some-time. I started using the ESP8266 and it worked. Now my doubt is in how to use the potentiometer, how to calibrate or if it interferes in something of the circuit. I did not understand what the purpose of the potentiometer is to vary the signal. I'm reading the Ro and I'm getting negative values, I made the cable change, the mq137 sensor, the mega sensor, I left 24 hours reading and I still get negative values. I am using the proposed code without any changes.